The following describes Northern Iron and Machines metallurgy processes. Elemental analysis is performed on an optical emission spectrometer. This device has a short measuring time with exceptional precision and stability. It provides a radiation reading emitted from an arc spark that is collected and shown as a percent concentration. Each element reading emits a different wavelength of radiation (color) when transitioned through various energy states. 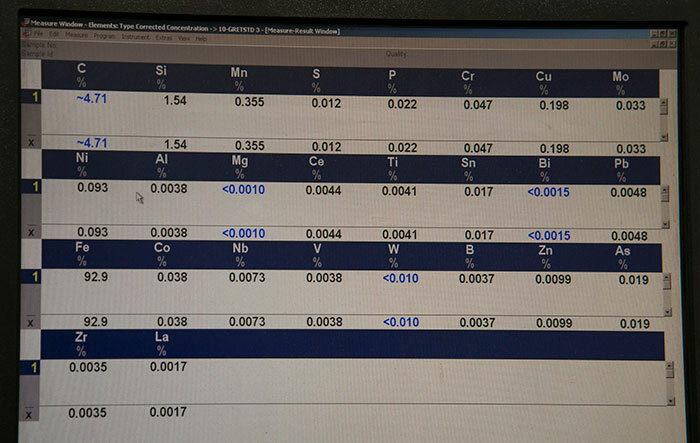 By measuring these wavelengths, the concentration and presence of various elements is determined. Nodularity testing for each tap is verified using a standard ASTM testing slug. Each slug is polished and viewed with 100X magnification in a light microscope. The percent nodularity is compared to an AFS rating chart. Based on these established standards, iron castings are thereby certified as having passed specified customer required standards. Northern Iron and Machine recognizes the importance of controlling mold sand because it affects material metallurgy and overall casting quality in several ways. To maintain sand within our process parameters, sand controllers are used with our sand mixers. These controllers are located at mixers that mix and deliver the sand to the molding machines. The mixers measure and control each batch of sand mixed. 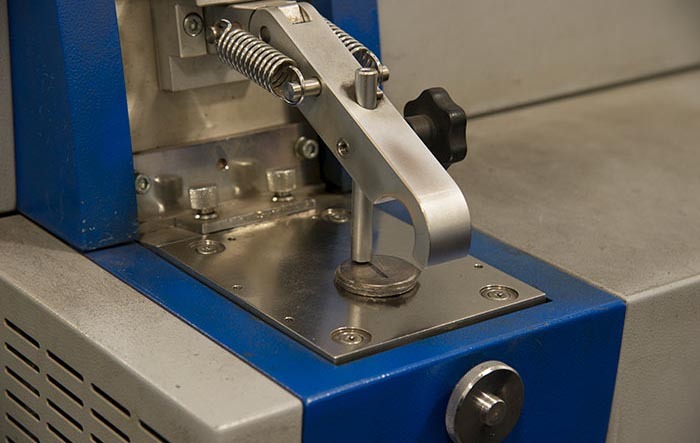 Northern Iron and Machine’s laboratory also samples sand at each line and performs several lab tests including compactability, green compression strength, permeability and methylene blue clay characteristics. For consistent analysis over time, both automatic controls and lab test data provide statistics, x-bar charting, trend graphs and histograms. For annealing and stress relieving iron castings, Northern Iron and Machine utilizes two ovens certified to AMS 2750E. When outside heat treating iron castings is needed, all chemistries are clearly specified and controlled by Northern Iron and Machine. These outside heat treat operations can include: normalize and temper, quench and temper, austemper and induction harden.